Garth Ennis and Steve Dillon bring Frank back to basics! 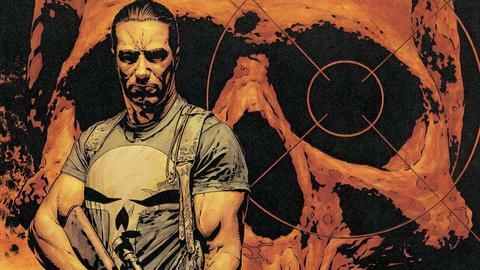 Get fired up for the November 17 debut of “Marvel’s The Punisher” on Netflix by exploring some of Frank Castle’s darkest, deadliest moments. Nearly 30 years after his first appearance, it seemed as though The Punisher had seen and done it all. He began as a pawn of The Jackal, then went on to become the scourge of the underworld and the driving force behind three ongoing series throughout the ‘80s and early ‘90s. Despite this success, he fell slightly out of favor (compared to the highs of his heyday), during the late 1990s. 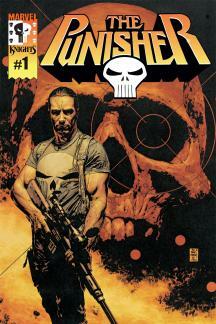 Then came writer Garth Ennis and artist Steve Dillon, launching Frank Castle into a new era of storytelling. 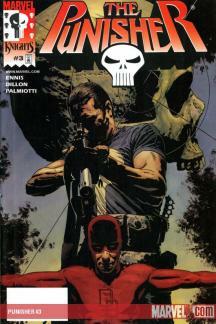 Their first 12 issue run on THE PUNISHER kicked off in 2000 and quickly become one of the most popular Marvel Knights books around. As retribution his past deeds, a group of angels briefly showed Frank his family in heaven before casting him back to Earth. “The angels thought it would be hell for me. But they were wrong,” Frank grimaced—Ennis’ way of saying that readers would be in for a whole different level of insanity with this new take on the character! Frank got to work cleaning up the city, bringing him into contact with a wild and memorable group of characters, from the people in the building he lived in, to the hapless Detective Soap, to enemies like Ma Gnucci and The Russian. Presented with the perfect level of action, humor, and violent insanity for a character like The Punisher, Ennis and Dillon excelled at putting this one man army into situations that seemed impossible to escape—and having him come out on top. A classic underdog, their version of The Punisher also had a serious mean streak. Despite this, it’s important to see how Castle separates himself from the other lunatics that inhabit his world. Upon meeting vigilantes like The Holy, Elite, and Payback, Punisher identified them as wildly reckless with innocent lives. He immediately refused their offer to lead their squad…and then opened fire. 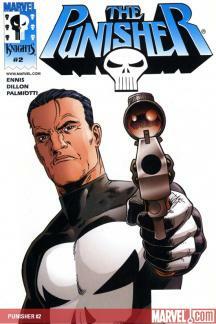 Ennis and Dillon then launched the PUNISHER ongoing series in 2001 under the Marvel Knights umbrella, which continued their brilliant take on the character with other artists like Tom Mandrake and John McCrea. In 2006, the title moved to the Marvel MAX imprint, where it ran for another 75 issues. Written by Christopher Golden and Tom Sniegoski with art by legendary horror artist Bernie Wrightson, the 1998 PUNISHER series kicked off with a confused Punisher living in the streets and giving help to those who needed it most. This interpretation of Frank, however, boasted glowing eyes, a strange symbol on his forehead, and the ability to pull any gun imaginable out of his trench coat! He got these perfectly Punisher mystical abilities by once being resurrected by an angel in order to continue fighting criminals, and now demons, alike.